It's just five months and a couple of days away from the May 2010 elections here in the country. Have you already made up your mind on the candidate that you will support? Honestly, I've been fickle-minded lately especially now that there are more debates being televised. 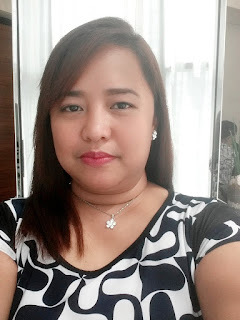 This is my first election-related post and I am not writing about my candidate yet. I will still need more time to think about who to root for this coming elections. In the process of discernment, I discovered a site that helped me know the candidates more. This site is Politicalarena.com. Together with PPCRV, COMELEC, and Youth Vote Philippines, it aims to promote voter education through online social interaction. 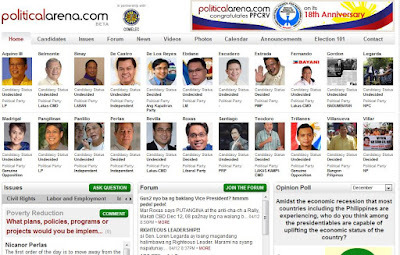 Politicalarena.com operates under the network of 88db.com, the Philippines’ first rich media service portal. In this site, members can browse through each candidate's profile and scrutinize their platform of governance. They can also post questions regarding political issues and other concerns. 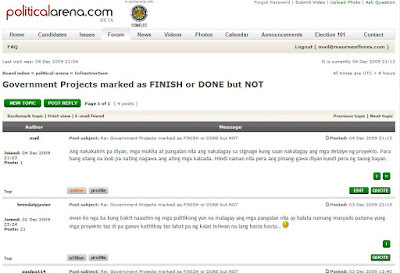 They can also interact with other users in the political forum. In fact, I got too engaged in an infrastructure thread that I immediately wrote what I felt about the issue. I think I'll be frequenting the site more as election day gets nearer. I already have a candidate in mind and I already pledged my support for him by clicking the I SUPPORT YOU BUTTON. Should I change my mind as the days go by, I can always click the WITHDRAW SUPPORT button. Voting for our next leader is a big responsibility so it is always helpful to have an open-mind and a listening ear to what others have to offer.